Singapore Airlines' (SIA) long-haul low-cost subsidiary Scoot is further exploiting the absence of a local LCC in Taiwan by selecting Singapore-Taipei-Seoul Incheon as its seventh route. Scoot is already the largest low-cost carrier serving Taiwan, which has the lowest LCC penetration rate among major Asian markets. Following the mid-2013 launch of Jetstar Hong Kong, Taiwan will also be the last remaining medium or large-size market in Asia without a local LCC. Scoot launched service in Sep-2012 on the Singapore-Taipei-Tokyo Narita route, which the carrier now serves daily. The carrier has been focusing primarily on stimulating demand in the local Singapore-Taipei and Taipei-Tokyo markets rather than on Singapore-Tokyo through passengers. Scoot will similarly focus on the under-served Taipei-Seoul market after launching the Singapore-Taipei-Seoul route on 27-May-2013 with an initial three weekly frequencies. The new route will also boost Scoot’s presence in the competitive Singapore-Taipei market as the additional three weekly flights make Scoot the largest carrier on the route, just ahead of SIA. Scoot’s expansion in Taipei should serve as a wake-up call to Taiwanese carriers, who have been so far reluctant to set up LCC subsidiaries or convert an existing subsidiary into an LCC. Taiwan’s three major airline groups – China Airlines, EVA Air and TransAsia – have all looked at the LCC model over the last year but have decided against launching LCCs. As Taiwan’s market continues to be invaded by foreign LCCs, driving up the country’s LCC penetration rate from the approximately 3% rate from 2012, one of Taiwan’s carriers will inevitably take the plunge. Once one Taiwanese LCC is established, the flood gates will open and there will likely be multiple local LCCs in the market. Until that happens, foreign LCCs such as Scoot, AirAsia and Jetstar will happily grab the low-hanging fruit where bilaterals allow. Scoot is the second Singapore-based LCC to take advantage of Taiwan’s liberal bilateral agreement with Singapore, which allows fifth freedom flights. Singapore-based Jetstar Asia has been serving the Taipei-Osaka market since Jul-2010, when it extended its Singapore-Taipei service to Osaka. The route was initially so successful that Jetstar Asia added a second daily frequency on the Singapore-Taipei-Osaka route in Mar-2012. As in the case with Scoot, Jetstar has been focusing on the under-served Taiwan-Japan market rather than carrying a large number of one-stop passengers between Singapore and Osaka. Australia-based Jetstar Airways in Nov-2012 launched three weekly non-stop A330 flights between Singapore and Osaka, allowing the Jetstar Group to allocate almost all its capacity on Jetstar Asia’s two daily Singapore-Taipei-Osaka A320 flights to the local Singapore-Taipei and Taipei-Osaka markets. Taipei-Osaka is now also served by Japanese LCC Peach, with a daily flight that launched in Oct-2012 and a second daily frequency added in Dec-2012. LCCs currently only account for 9% of capacity in the Taiwan-Japan market, with 3% shares from each of the three LCCs now serving the market – Jetstar Asia, Peach and Scoot. There are currently about 180,000 weekly return seats in the Taiwan-Japan market. In a similarly sized market in Southeast Asia, Singapore-Malaysia, LCCs currently account for 56% of seat capacity. The Taiwan-Japan market is poised to see a rapid increase in LCC penetration as Peach looks to expand in Taiwan and as Taiwan is on the radar for Japan’s other two new LCCs, AirAsia Japan and Jetstar Japan. AirAsia Japan and Jetstar Japan could leverage the existing operations of their sister carriers in Taiwan. The AirAsia Group already serves Taipei with a daily service from Kota Kinabalu operated by its Malaysian subsidiary and a daily service from Manila alternative airport Clark operated by its Philippine affiliate. Long-haul sister carrier AirAsia X also serves Kuala Lumpur-Taipei with a daily widebody flight. As a result the AirAsia brand has a 1% share of international seat capacity in Taiwan and a 20% share of total LCC capacity to and from the country. Jetstar also currently has about a 20% share of LCC capacity in Taiwan. Scoot is already the largest LCC brand in Taiwan, with a 23% share of total LCC capacity. Scoot’s share of LCC capacity in Taiwan will increase to about 32% in Jun-2013. Scoot will account for about 1.6% of total international capacity to and from Taiwan in Jun-2013. Taipei is now served by 13 foreign LCCs. The number of LCCs serving Taiwan and the number of LCC routes from Taipei will continue to increase. VietJet Air is now looking to launch Ho Chi Minh-Taipei services by the end of 2013 while Peach is looking at adding Okinawa-Taipei to supplement its Osaka-Taipei service. Taiwan is also a likely market for Jetstar Hong Kong, which is launching services in mid-2013. Taiwan is an attractive market for Asian LCCs as in many cases routes from their bases to Taipei are not currently served by any LCCs. For example the Taipei-Hong Kong market is not currently served by any LCCs although it is the largest international route in the world. Taipei-Ho Chi Minh and Taipei-Okinawa are also not currently served by any LCCs. Taipei-Tokyo was not served by an LCC until Scoot’s entry into the market in Sep-2012. Scoot will also be the first LCC in the Taipei-Seoul market. Tokyo is the second largest international destination after Hong Kong from Taipei while Seoul is the sixth largest, based on current seat capacity. Taiwan-Japan and Taiwan-Korea are both very large short-haul markets that have been characterised by high fares due to the lack of LCCs. Bilateral restrictions between Taiwan and other North Asian countries ironically make it easier for Singapore-based LCCs to enter these markets than new Taiwanese or Japanese carriers. This has particularly been the case in the Taipei-Seoul and Taipei-Tokyo markets. For Taipei-Seoul, Scoot’s latest fifth freedom target market, the Taiwan-South Korea bilateral has historically only allowed two carriers from Taiwan and two carriers from Korea. This restriction has resulted in the market being underserved by local carriers and has left an opening for carriers that have fifth freedom rights between Taipei and Seoul. Cathay Pacific and Thai Airways both have operated between Taipei and Seoul for several years but the upcoming entrance on Scoot is more significant as it brings low fares to the Taipei-Seoul market for the first time. Scoot currently offers one-way economy fares (including taxes) from Taipei to Tokyo starting at TWD3,498 (USD117). It has not yet started selling tickets from Taipei to Seoul and offers economy fares from Taipei to Singapore starting at TWD2,999 (USD100). The expansion of Scoot in Taiwan should put pressure on Taiwanese authorities to extend the bilateral with such countries as South Korea, opening up more flights for their local carriers. More rights for Taiwanese carriers to South Korea is expected within the next few months. 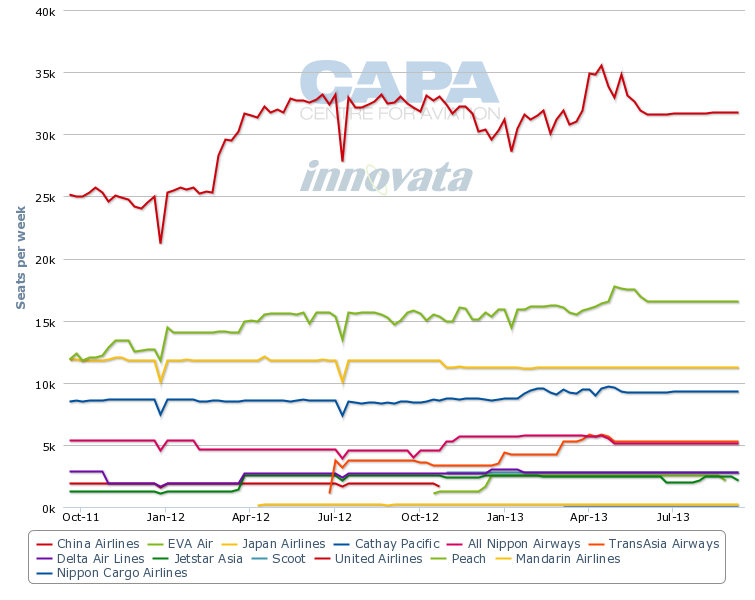 TransAsia is now aiming to join its larger competitors, China Airlines and EVA Air, in the Taipei-Seoul market. TransAsia could launch services between the two cities at about the same time as Scoot’s Taipei-Seoul launch. TransAsia, which is Taiwan’s third largest carrier, is now only able to serve Busan and Jeju in South Korea. The Korean LCCs serving Taipei are also now limited to the Taipei-Busan and Taipei-Jeju routes due to the archaic two-carrier restriction for Taipei-Seoul. China Airlines and Korean Air now each operate two daily flights between Taipei and Seoul while Asiana and EVA each operate nine weekly flights. Cathay Pacific and Thai Airways currently serve the market with one daily flight each as part of Hong Kong-Taipei-Seoul and Bangkok-Taipei-Seoul routings. Scoot will enter the market with significantly lower fares than the incumbents. But the impact on the incumbents will be minimal as Taipei-Seoul is an underserved market and Scoot is limited to three weekly flights. While Singapore-Taiwan has a very liberal regime, the Singapore-South Korea bilateral is almost at capacity and cannot support an additional daily flight from a Singapore-based carrier. Singapore has been pushing for an expanded bilateral from South Korea, which would open up more opportunities for Scoot as well as its parent SIA, but Korea has been reluctant as its carriers are not yet fully utilising their existing rights to Singapore. Scoot initially indicated it was not considering South Korea for its 2012 or 2013 network as the Singapore-South Korea bilateral did not allow the carrier to serve the market with a daily flight. Scoot initially only included South Korea, including Seoul and Busan, as part of its long-term network development plan assuming a new bilateral could be forged. But the attraction of the Taipei-Seoul market prompted Scoot to relook at entering the Korean market earlier. Singapore-Taipei also has proven to be a successful route for Scoot that can support an increase from the current seven to 10 weekly flights. The 10 weekly 777-200 flights Scoot will offer in the Singapore-Taipei market starting in late May-2013 will give the carrier a leading 20% share of the market, surpassing SIA by 30 weekly seats. Scoot is offering a one-stop product on Singapore-Seoul but will likely focus primarily on selling the individual shorter sectors, which is a more lucrative approach. Scoot will want to avoid cannibalising its parent SIA, which operates four daily flights between Singapore and Seoul. While Scoot has entered some markets such as Sydney alongside SIA, with Tokyo and now Seoul it is taking a different approach by offering a one-stop product and focusing on primarily selling the local sectors. This results in virtually no overlap with SIA. Singapore-Taipei-Seoul will be one of two routes Scoot adds during the northern hemisphere summer 2013 season. The carrier's eighth route, possibly a third route to mainland China, will be announced shortly. The two additional routes are made possible by the placing into service of a fifth 777-200, which will be delivered to Scoot in May-2013. Scoot now operates four 777-200s from Singapore to Taipei, Tokyo and Bangkok as well as Gold Coast and Sydney in Australia, and Qingdao, Shenyang and Tianjin in China. Qingdao and Shenyang are tagged but unlike Taipei-Tokyo, Scoot has to operate the Qingdao-Shenyang-Qingdao legs without pick-up rights. After Singapore-Taipei-Seoul and the not yet announced eighth route are launched, Scoot will take a hiatus from expansion until Nov-2014, when the first of 20 787s are slated to be delivered. Scoot took over SIA’s order for 20 787-9s in Oct-2012. 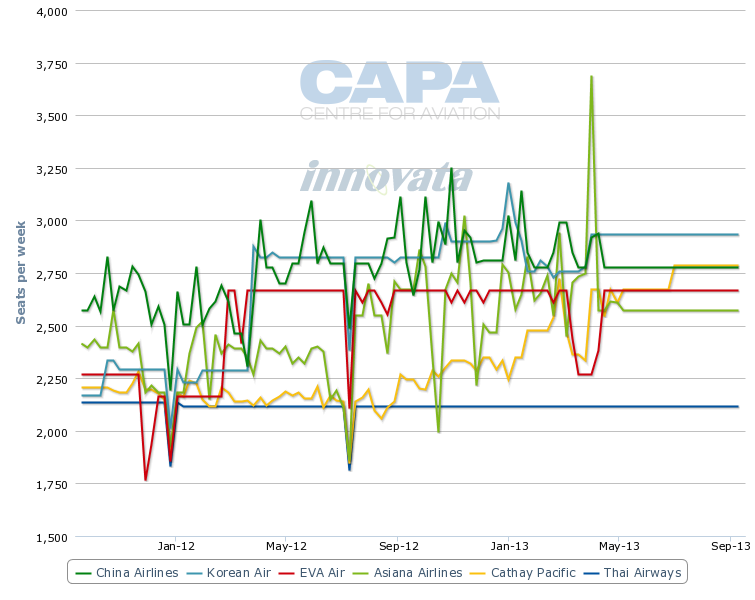 Scoot CEO Campbell Wilson told CAPA’s Aviation Finance Asia Summit in Singapore on 20-Mar-2013 that the carrier now plans to take 10 787-9s and 10 787-8s. The SIA Group has the flexibility to switch to the smaller -8 as part of its original 787 order, which was placed in 2006. The first 787 delivered to the SIA Group/Scoot will be a -9 but the SIA Group/Scoot is in the process of adjusting its order so that 10 of the subsequent 19 deliveries, which will come primarily in 2015 and 2016, will be -8s. The 787-8 gives Scoot more flexibility as the carrier can use the smaller type to enter thinner markets such as Busan in South Korea. The smaller 787s will also be better for opening new thin routes, such as Sapporo and secondary cities in India that Scoot has determined are too thin for its 777s. In addition, the smaller size and better operating economics of the 787 will allow Scoot to increase frequencies on several of its existing markets from 2015. Although the 787s are clearly the future for Scoot, Mr Wilson stated that the 777s got Scoot “off the ground effectively” and the carrier has performed well its first nine months, proving the medium/long-haul LCC model works. Partnerships have also become a key part of Scoot’s model and the carrier is now working on forging deals with carriers outside the SIA Group. Scoot currently offers 35 offline destinations through its three partners – SIA, SIA full-service regional subsidiary SilkAir, and SIA short-haul low-cost affiliate Tiger Airways. So far Scoot has been focusing on leveraging the Singapore Changi hub to offer offline connecting destinations to passengers originating in the eight cities it currently serves from Singapore with its own aircraft. But as Scoot builds up its operation at Taipei it should look to also secure partners in Taiwan. Scoot is already offering Taiwanese customers connections via Singapore to 30 destinations throughout Asia and Australia. Scoot could potentially use Taipei as its North Asia hub and work with several carriers serving Taiwan from offline destinations in Asia and beyond. With an LCC penetration rate that is now approaching 5%, up from 3% a year ago, the Taiwanese market is ripe for more LCC capacity. In comparison, LCCs now account for 30% of capacity in Scoot’s home market of Singapore. 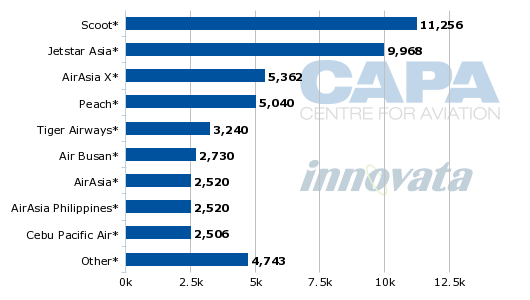 The Singapore and Taiwan markets are similarly sized, with Singapore being the 10th largest in Asia and Taiwan the 11th largest, based on seat capacity. Scoot has clearly noticed the potential opportunities of the Taiwan market and could pursue further expansion in Taipei, increasing the pressure on Taiwanese carriers to finally respond with their own LCCs.